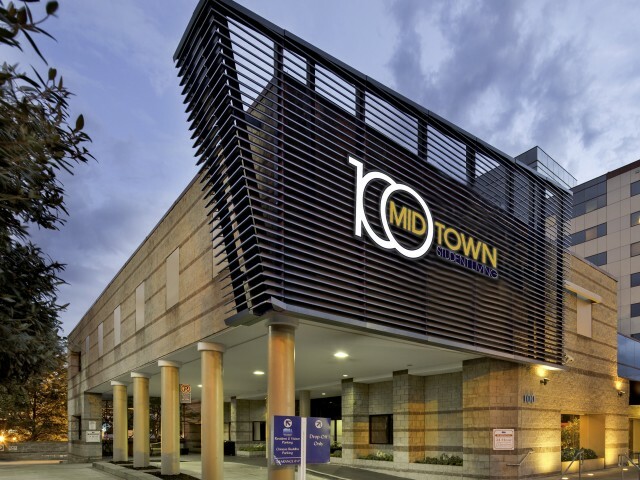 100 Midtown offers 2- and 4-bedroom apartments for rent in Midtown Atlanta. Each apartment has a full kitchen and is outfitted with leather furniture. Internet, cable and water are included in rent, and every unit has its own washer and dryer. Our 24/7 emergency maintenance services ensure that issues are handled in a timely manner, and our 24-hour computer lab and 24-hour fitness center let you study and work out whenever your schedule allows. Other outstanding amenities include a video gaming room and a theater room with a DVD/Blu-ray player, an HD projector, and real theater seating. Plus, 100 Midtown is conveniently located in the heart of the Georgia Tech Campus, just a five-minute walk from the Midtown MARTA station. We also have quick and easy access to the AUC, Georgia State University, and SCAD Atlanta. With move-in ready apartments steps away from some of the city’s best dining, shopping and nightlife venues, why would you live anywhere else? Schedule your personal tour by contacting us today.